Pressure Pro E4040HC Review: Should You Buy Yay or Nay? 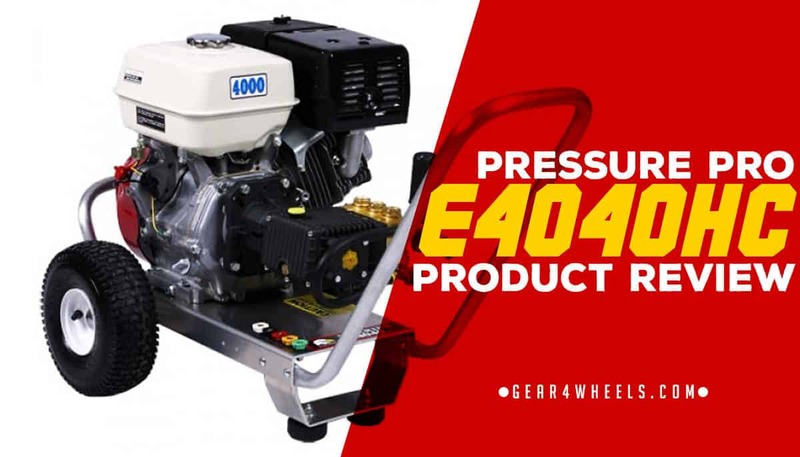 The Pressure Pro E4040HC Pressure Washer is a model that comes from the premium range, known for their more durable designs and heavy-duty components. Despite its large footprint, it is still reasonably lightweight, as well as being easy to understand and operate. It also has a very reasonable price tag for a premium, gas-powered pressure washer. Aircraft-grade aluminum creates an incredibly hard-wearing product. Good warranty, yet confusing as to what is covered and how long. The heavy-duty design and minimalistic frame decrease accessibility. Doesn’t come cheap, but is reasonable for a premium model washer. The Pressure Pro E4040HC is a powerful washer, best used for commercial purposes. However, that is not to say that it wouldn't be suitable around the home. Thanks to a price tag that is just a third of some pricier heavy-duty washers, it could be purchased for cleaning the driveways, decking and exterior walls of larger homes. This pressure washer is built for a tough ride, with an extremely durable frame built from aircraft-grade aluminum and extremely heavy-duty tires that won't run flat. These features set it in good stead to perform as a commercial or industrial washer, either within small to medium sized businesses, or in warehouse environments. The CARB compliance rating also ensures that environmental obligations will be met if it is operated within business premises. The pressure washer is lightweight enough to be operated by a single user, despite a lack of 2 additional wheels. Though it requires some strength to move, it’s not as heavy as many other models within the premium range. Still, you’ll need to be strong enough to move this about if completing larger cleans or those that require a lot of maneuverability, such as cleaning larger SUVs. As would be expected, this pressure washer comes out of the box with nozzles included. In total, there are 5 nozzles, though the manufacturer doesn't specify exact information on the specific angles of spray that are achievable with these nozzles. The quick-connect mechanism makes them simple to attach and detach, so changing jobs is easy. The only other included component of note is the hose. At 50-feet, the hosing is steel-reinforced, which not only protects the component against damage, but also prevents surfaces from being damaged when dragging during operation. Unfortunately, this model does not come with any additional instruments, such as hose reels, hose extenders or wand extenders. It would also have been beneficial for the manufacturer to include other optional consumables, such as motor oil or pump oil, as these are required for the safe operation of gas-powered pressure washers, and to protect the internal components. Aside from the powerful yet near-silent 13-horsepower Honda engine, this pressure washer comes with a raft of other functionality. It has around double the usual length of hosing offered by budget to mid-range models, which is also steel-reinforced for durability. Even with a gas-powered engine, overheating is unlikely owing to a thermo-sensor, which automatically shuts off the engine if the safe operating temperature is exceeding. Finally, this washer also includes a low-oil shutdown feature, which shuts the unit down when the oil levels fall below safe operating levels. Both of these features make this a long-lasting product that is rated well for safety. The Pressure Pro E4040HC is among the premium range of pressure washers, yet sports a price tag that is far more appealing than many of its competitors. Despite this, it doesn’t sacrifice on cleaning power, with an impressive 16,000 CU rating. The 13-horsepower Honda engine requires constant upkeep in the form of oil and gasoline, something that an electric motor does not need; however, the power offered by this heavy-duty unit is far better than a washer powered by main electricity.